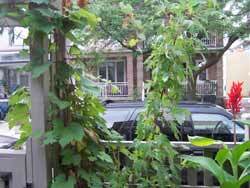 Plants for planters in Toronto.Plants that don't die in planters over the winter. Because of the constant freeze and thaw in the spring, it is difficult to keep plants in planters alive from year to year in Toronto. 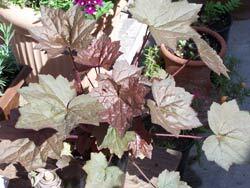 Over the years I have tried to overwinter many plants and have ended up with a few proven survivors. To overwinter a planter it is also important to make sure it doesn't dry out completely but at the same time the roots can't be kept wet. After several failures I have finally managed to keep hostas happy over winter. it's really important to not saturate the roots in winter and early spring. Lovely pale green foliage that cascades out of planters. No flower that I've seen. I plant annuals among them and it makes a lovely container. Works well for hanging baskets too. They don't seem to mind the winter at all and faithfully resurface every spring. Also called Pink Chablis, it comes back and lives in the shade garden. Lovely variegated foliage are a great contrast to the darker greens. It dies out in the fall and grows back in the spring. Easy to propagate by separating the roots. I dont know it's name, Another tough little guy, he seems to do well with a little less water. He sports shiny thick leaves cascading out of pots and seems oblivious to any pest I've seen. Comes back every spring. If I want to spread it all I need is to pull out a few strands and stick them where I want them. How easy is that? 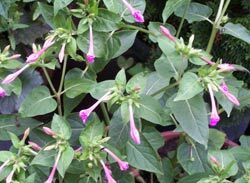 One of the few perennial flowers that consistently come back, four o clocks open up late afternoon and smell heavenly all evening. These were grown from seed. They come in many colours including white, red and yellow. 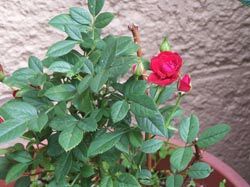 I've tried many rose bushes and mostly they just die over the winter. I've had moderate success with a couple of miniature roses. They seem to die back but live to recover. I even tried the wonderful wild types but they also croaked. These came as volunteers and have managed to come back for several years. 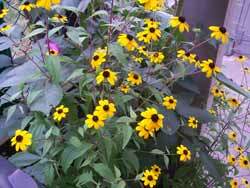 The first year did not produce flowers but second year produced lots of yellow blooms. They are tough and seem to do just fine in semi shade. They don't seem to mind a small pot if they get enough water. 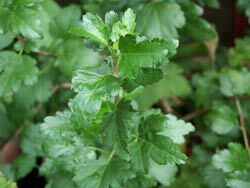 Currant bushes have proved to be hardy and dependable. You will also get a bowl full of fruit after the second year! Mine seems to get some frost damage every year but a quick trim and it quickly recovers. I picked up this little plant as a volunteer between 2 paving stones on the street. It is not as handsome as the emerald cedar I bought but it is tougher to damage. I think using native plants is often a good plan in difficult locations. 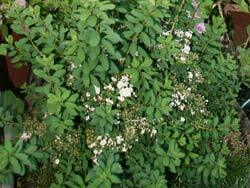 I have had good success using local wild plants, particularly the ones that grow in difficult locations. 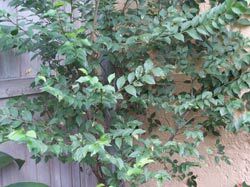 Considered a garbage tree by many, I have found that this little bush is a tough cookie and a fast grower. It likes alot of water but otherwise keeps on living. The cats have used it as a scratch post for years and this has earned it a spot in the garden. I trimmed it as a standard for a few years and it looked surprisingly good. Much tougher than the caragena standard I bought and who proved to be a delicate little prima donna. Volunteers who just appeared. The maple probably flew in as a key. They have both survived a couple of winters and pay the rent by giving some height to the plantings. The Boston Creeper fills up the trellis and needs to be beat back every year. 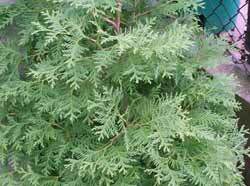 If you are willing to water it regularly it will reward you with years of evergreen foliage. 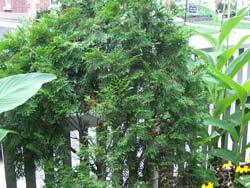 Cedars are a great choice in a pot. They seem to tolerate just about any weather and are lovely to look at and smell. They are also very nice to look at in the winter. 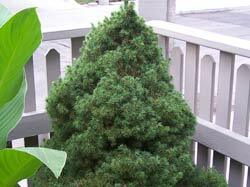 Generally I've had good success with my conifers and they all seem to do OK as long as they are hardy enough for this area. Pots don't seem to damage them too much. 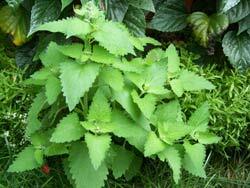 I have catnip plants that have come back for several years in a row. I keep a few plants just to please "les chats". Other mints have also done well and come back each spring. None are particularly pretty but I favour a peppermint plant that smells lovely when I brush against it. As a whole I've not had much luck with herbs generally. The only one that is hardy enough is chives. Did you know that catnip repels mosquitos, cockroaches and termites? Plus cats like it. Variegated dogwood makes a good show plant with its colourful leaves and red stems. I have to keep trimming it back but it just keeps growing. it's a bonus that the trimmings make nice cut foliage inside with a couple of flowers. 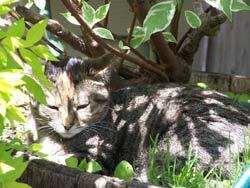 I keep the base cleared of branches and the cats like to sleep under the foliage in the cool shade. Another survivor, it pays the rent by producing lovely white flowers in the spring. This year I've had an infestation of aphids, soon enough the ladybugs took over and cleaned them up. Now they are clean. I don't usually spray because I don't like to be around poisons and useful bugs seem to get to work soon enough to prevent real damage. 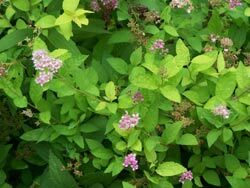 Lovely light green foliage and pink flowers that come in spring and seem to go on till the end of summer. This plant seems to be un-killable. I prune quite severely but carefully every spring to keep it smallish. 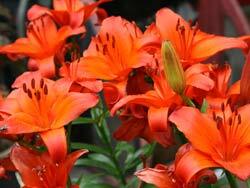 It is a lovely colour and is welcome in any garden I plant. Almost all my lilies survive beautifully in pots. it's sad they have a limited flowering period. This is my grand winner survivor. 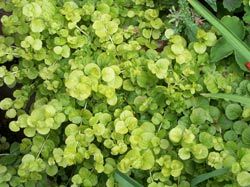 Handsome bronze foliage, drought resistant, almost un-killable, plus it reseeds itself so they increase if you want more. 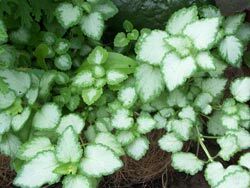 This plant creates a nice contrast with other foliage or flowers. It can tolerate full sun or full shade. grass has had mixed success overwintering. 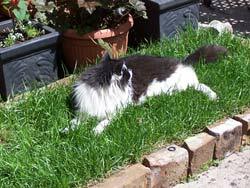 I have planted some at the base of various bushes as well and the cats love to go and sleep on it when it's hot. I've killed all the clematis I've tried except this one. 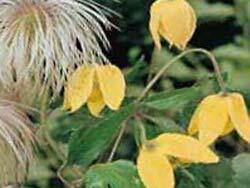 It produces little yellow flowers and fabulous furry seed pods. It comes back year after year and grows to good size. It needs the odd bit of pruning to keep it within bounds but otherwise it is not a trouble maker. Can tolerate some shade even. It is not as showy as the large purple flowers but it is reliable. 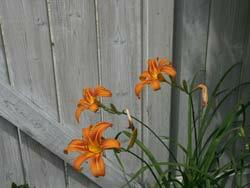 Another reliable lily growing in my garden and adding colour and nice foliage to the mix. Cats seem to like going and smelling them. They don't seem to ever eat them though. That's a good thing because they are poisonous. I keep other plants for eating, such as grass, catnip, and spider plants. Not a fast grower but never says die either. I've had this tree for at least 5 years and it seems to keep on growing slowly and looks nice. He smells nice too. In the spring he gets covered in soft new needles. This spring was tricky because we had a nice warm spell, then the weather turned cold and wintery. This tricked several plants into growing too soon and getting some frost damage when it turned cold again. What dies in pots then? I've tried for years to grow HOSTA and they simply don't make it over the winter. I now bring them into the cold room. Read my page on growing hostas. MOST ROSES have died. Best success has been with miniature roses. My EUONIMUS always die sadly. Most HERBS seem to be too sensitive. I've kept a Sage plant for a couple of years and once a lavender plant made it for one year but no luck with others except mints. I tried BOXWOOD with no success. Most ALPINES seem to have trouble, I had HENS and CHICKS that survived one winter but that's all. Sadly I've killed Purple coneflowers, lupins and bleeding hearts in pots. I've grown then very successfully in normal gardens. I'm not a plant killer and generally can grow thing really well, but I have not figured out the trick for plants in pots. I've tried deep mulch all around the pots, I've even buried pots with soil to no avail. I've also tried insulated double walled pots. Many plants will survive if they are stored in a cold-room but that's not what I'm trying to do. 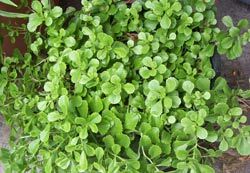 I'm looking to plant things that will stay alive in the harsh conditions including in particular the thaw and freeze that is inevitable with pots.